Fine Art Thangka Print by Flera Birmane. A stunningly beautiful painting of 1000 Armed Chenrezig or Avalokiteshvara. Here he is shown with 11 faces and 1000 arms. His Eleven faces each have their own colour: 4 faces are red, 3 white, 3 green and one dark blue. Eleven faces symbolically represent the complete realization and accomplishment of the 10 stages on the Bodhisattva’s path to enlightenment. The three white faces represent form-bodies of all the Buddhas, and Avalokiteshvara benefits all sentient beings through the essence of this form, and the blessings of this form, and the activities of this form. 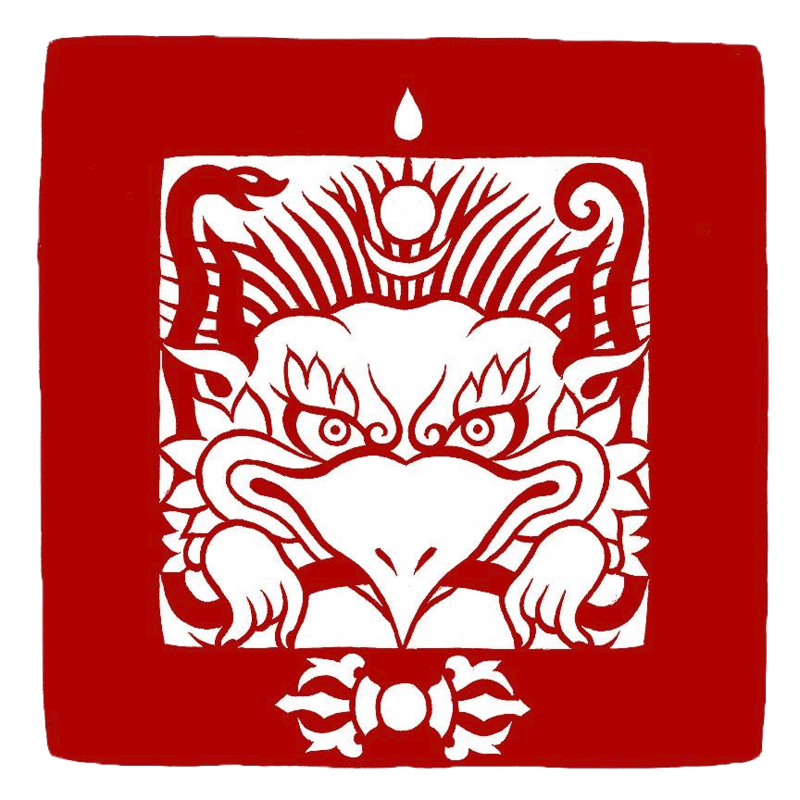 Similarly, the three red faces represent a speech of all Buddhas, and Avalokiteshvara benefits all sentient beings through the essence of this speech, and the blessings of this speech, and the activities of this speech. The three green faces represent a mind of all the Buddhas, and Avalokiteshvara benefits all sentient beings through the essence of this mind, and the blessings of this mind, and the activities of this mind. The wrathful, dark blue face on top represents how Avalokiteshvara benefits sentient beings that are very difficult to subdue or to tame. Wrathfulness is a compassion turned into anger, because it is compassion in its most powerful state. On top of the wrathful face is a red, Amitabha Buddha face, Avalokiteshvara belongs to the Amitabha Buddha Family, or the Lotus Family. Avalokiteshvara has one thousand arms, of which 992 are in the gesture of supreme giving, and one thousand arms represent the one thousand chakravartins (universal monarchs). They also represent Avalokiteshvara’s wish to protect all beings in a thousand different ways. Finally, the one thousand eyes and arms represent the activity of all one thousand Buddhas combined together. Original Medium: stone pigments on cotton with real gold. Printed on 100% museum grade fine art cotton paper. Shipping: Please allow 2 to 4 weeks for delivery for this item as it will be shipped to you direct from the artist.